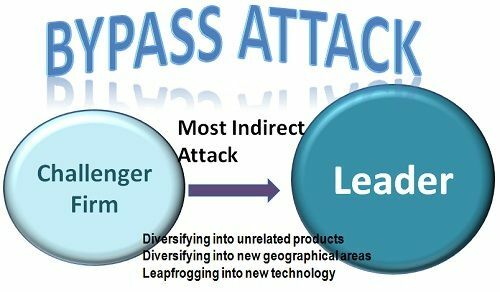 Definition: The Bypass Attack is the most indirect marketing strategy adopted by the challenging firm with a view to surpassing the competitor by attacking its easier markets. The purpose of this strategy is to broaden the firm’s resources by capturing the market share of the competing firm. The firm can adopt any of the three approaches before launching the bypass attack; they can either diversify into the unrelated products, into the new geographical markets or leapfrog into the new technology. Any of the approaches can be followed, provided the firm is well equipped with the resources and is more powerful than the competing firm. The leapfrogging in the new technology means the firm performs a thorough research and launches the next generation technology with the intention to attract more customers and shift the battleground to its own territory. This type of approach is very much prevalent in the Mobile Industry; wherein the companies launch new technology one after the other to supersede the competitors. Apple and Samsung are the well-renowned companies that follow the bypass attack. The war between the Coke and Pepsi is the another example of this approach. The Pepsi used the bypass attack against Coke by launching the Aquafina, mineral water brand, very much before the coke’s Dasani Brand.